For today’s saturdaystudying @ maryplethora I decided that I would do an A Day in the Life post of a day where I mostly spend the entire day studying. So get ready for an epic tale of Chemistry and Maths revision, noodles and a trip to my Gran’s. 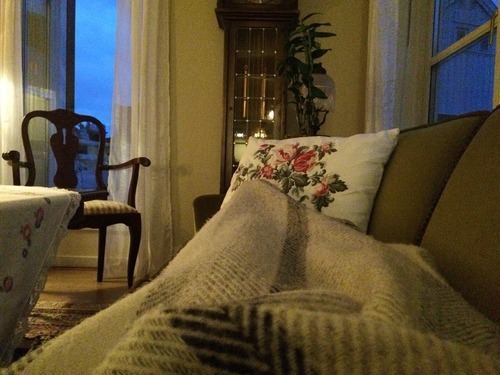 A few weekends ago I was so lucky as to have the entire house to myself. As I am still in the Norwegian equivalent of High School, I still live with my parents and my younger brother, so being all alone is quite uncommon. Anyway, my parents were away and my little brother was as well. This means that for most of the weekend I was able to do completely as I wished, and therefor get quite a lot of work done. Sunday was only one of my work days, and I thought I’d take you through how such a day can go for me. 8:33 – Woke up after a night of hectic dreaming. I can’t remember what about, but I didn’t really feel rested when I woke up. Oh well. Time to get out of bed. 8:45 – First cup of tea of the day is steeping and the kitchen is mostly tidied after yesterday’s dinner. Now to making breakfast, as I can’t get anything done on an empty stomach. 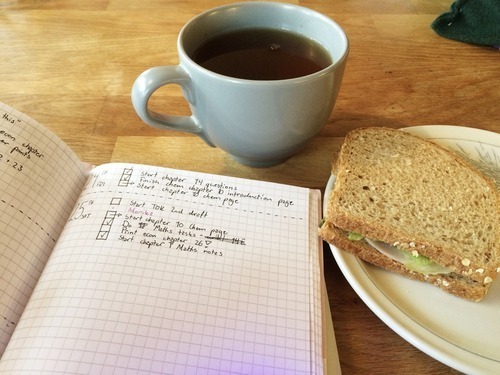 8:50 – Eating breakfast and having tea while reviewing yesterday’s and today’s to-do lists. Actually I realised after taking this picture that I hadn’t made today’s list yet, which was surprising as I’m always several days in advance when making them. 9:00 – Deciding that it was time for multitasking and started some light blog work while finishing up my breakfast. It’s still a bit soon after waking up to start on actual schoolwork. 9:30 – Finished writing and posting blog post, as well as a tumblr post about the post. Shameless self promo for life. Now to the next thing on the newly made to-do list: Chemistry. 9:42 – After some more time spent on the blog, I’m actually going to start the Chemistry. 10:17 – Back from a break from work. This one involved reading emails, a change of clothes, some washing up and making a second cup of tea. 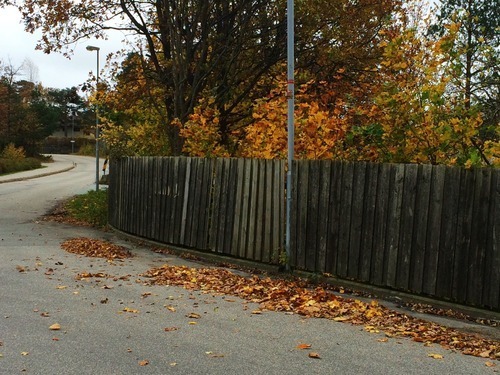 10:44 – Took out the rubbish and had a bathroom break. I’m maybe halfway through Chemistry now. 11:10 – Finished Chemistry and got hungry again. Seeing as I’m not having dinner until four, I made noodles. Also, I decided a break was in order before starting Maths. 11:40 – The break turned out to be longer than it probably should have, but at least I got some pictures for a future blog post. Also, doing stuff while eating noodles is pretty difficult. 12:00 – Still not finished the noodles, but I’m at least getting started on my Maths work. 2:30 – Third cup of tea made, still working on Maths. 3:20 – Finished Maths, finally. I hate binomial expansion to the depts of hell. Now to get ready for dinner with my Gran. 3:45 – Leaving for dinner. My Gran lives about 15 minutes from us if you walk, so that’s what I’m doing. It’s so sad to see that it’s already getting dark, and I even had to put on my winter coat to keep warm. I’m dreading the winter. 4:55 – Dinner is eaten and it was delicious. As was the strawberries we had afterwards! 6:15 – Post-dinner nap is done with and now we’re having cake. And I was only planning on staying for an hour. 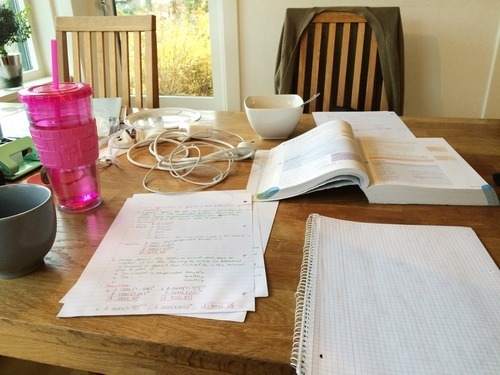 7:15 – Just got home and cleaned up some stuff, and now I’m starting my second maths session. Yay productivity. 8:20 – Finished maths for the second time! Now to some work on another blog post, while watching Suits. I swear that it was easier to stop after one episode in the last season! 8:55 – Finished typing up another blog post. Next stop: Bathroom! Then another episode of Suits and bed time. Ah, I miss my bed. 9:40 – Finished the Suits episode and got inspiration for another blog post. Bed time postponed. 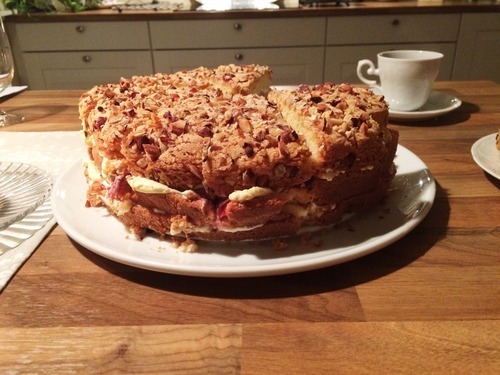 10:07 – Blog post all typed up, just lacking the main photo. Now to bed, finally. God, it’s been a long, but fortunately productive day. Do you guys have any special routines for a day reserved for studying, or do you start off without plan and just go from there? Let me know. I’d love to hear from you!